For as long as I can remember, I have loved curtains swaying in a breeze. They are mesmerizing, and a meditative experience if you allow them to be. They remind me of a slow breath moving in and out in a graceful dance. 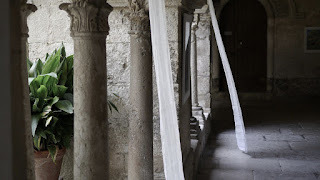 In 2014 when my husband, Dennis, and I were in St. Rémy, France touring the Saint Paul Asylum (once occupied by Vincent Van Gogh), Dennis captured the essence of simplicity - sheers swaying in the breeze in an outdoor corridor. Watching the gentle sway was intoxicating, and I must say very calming. While Dennis has taken a lot of amazing photos, this is one of my favorites because it speaks to me. I can feel the air move in and out in what was an extremely relaxing moment in time. It reminds me to slow down and just breathe. Over the years I can look back and remember curtains swaying in the breeze in my Grandma Mary’s home, in the home we just sold, and in the home we rented in Sedona, AZ. Whenever I see a breeze tickling curtains it causes me to stop and consider peace within myself and gives me a subtle sense of joy, a subtle sense of magic. I’m sure this all has a deeper meaning, but all you need to know is I have decided, in a year of change, that this photo will now be representative of this website as well as my Facebook page. I may not have a home of my own, but I am making my home wherever I am in the world - and if I have swaying curtains, all the better! While I enjoyed having the dandelion seeds floating in the breeze with endless wishes representing, It Is What It Is, I have grown, and one may say sprouted, in different directions in my life. These swaying curtains in the breeze of St. Rémy represent who I am right now as Dennis and I travel about the globe in a somewhat houseless manner. I hope you enjoy the look of the new and improved It Is What It Is. Let me know what you think. I’d love to hear from you. 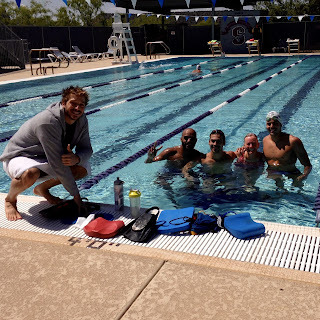 As I walked up to the recently opened community pool in Sedona, Arizona to swim laps, I found that the Brazilian National Swim Team was using the facility. It seems they were training in Flagstaff and it was too cool so they were here for the rest of the week. When I was at the pool a few days before, half of the pool was open for lap swimmers and the other half for a water aerobics class. There were only three lap swimmers so I had a lane to myself. That swim was a lovely experience with the Sedona red rocks as a backdrop to a beautiful outdoor pool. Expecting a similar swim experience as I head over a few days later, I wasn’t really excited about sharing a pool with a swim team. But I thought, Oh well, I’m here so I’ll check in and see if I can catch my laps. The lifeguards were more than willing to make sure I was able to swim during the scheduled community swim time. They even set me up with a lane all to myself. As I was talking with one of the lifeguards, she explained why the Brazilian team was in the pool and that’s when I connected what they had been telling me previously to Olympic team! Okay then, I’ll just slip in and do my thing, I told the guard I would do my best to represent the United States (being the only lap swimmer in the pool other than the Brazilian team). I did more than catch my laps that day. I caught a lifetime snapshot experience I won’t ever forget. While I’m no Olympic caliber swimmer, I’m a very good swimmer and didn’t feel self-conscious in any way, so I just went about doing my normal workout. I couldn’t help thinking about a little girl at summer camp some fifty years ago who was bullied because she didn't know how to swim. Ha, thanks for that you mean girls! Look at me now! In case you are new to It Is What It Is, you might be interested in the article I previously posted on Summer Camp 1965. When I finished my laps, I got out of the pool and walked over to one of the four team coaches. I told him how much it meant to me to have been in the pool swimming laps with his Olympic team. Once they finished their workout, he and a few of the team members were gracious enough to snap a shot of a memorable moment for me. I smiled like a fool the rest of the day, and the energy I was emanating must have filled the entire red rock area of Sedona with more happiness than usual. You never know how your day is going to play out. If I had been self-conscious I could have simply walked away from this unsuspecting personal high. We all have doubts but the key is learning to trust ourselves and push doubt and fear away. It's our choice. I know this is one of many lifetime snapshot experiences I didn’t push away, and I look forward to many more as I head on down the road.